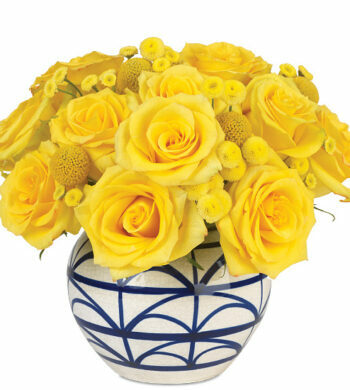 A swirling bouquet of summertime blooms is a bright and cheerful surprise. 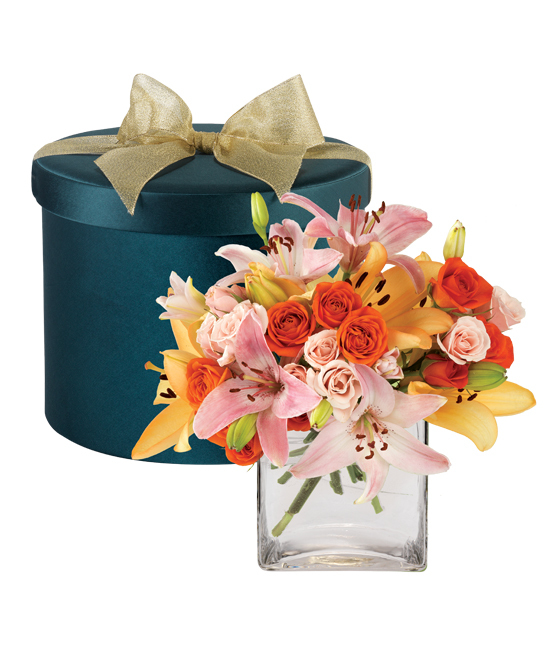 Presented inside our garden green satin hatbox topped with a gold bow, the perfectly arranged bouquet boasts Mambo orange and pink Majolica spray roses mixed with pink and peach Asiatic lilies, all nestled in our 4″ square glass vase. Remove the bouquet by pulling up on the handles of the insert immediately upon arrival. Gently lift the bouquet from the slotted center. Fill your vessel ¾ full with warm water and add the contents of the Calyx floral preservative package. Remove the hydration system from the stems, the foam is a bio-degradable material and can be discarded safely. REMOVE band around end of bouquet. 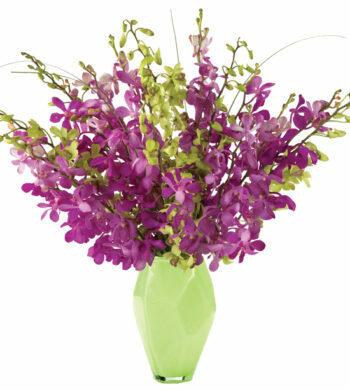 Trim about a ½” from the bottom of your bouquet while holding the stems under water, and place immediately in the vessel. Keep your arrangement away from drafts, direct sunlight and excessive heat or cold. Change water and recut the stems every 2-3 days to maximize longevity.